First things First: Set A Goal - You CAN Go the Distance! This might seem like a no-brainer, but so many people skip the most important step for achieving anything. You have to know what it is you want to accomplish. You have to set a goal. It is essential that you set goals in your life. Goals give you something to stay motivated about, a target to aim for, a dream to make real. “I want to run a marathon,” is, indeed, a goal. But it’s not a great goal. It is too vague. You need to make it more specific so you can take the necessary steps to achieve that goal. Saying “I want to run a marathon” is really like saying “I want to be rich.” The problem is “rich” means different things to different people and it is too open-ended. It would be better to say “I want to have $100,000 in my bank account.” It would be even better to say “I want to have $100,000 in my bank account within the next 5 years.” Now that’s a goal! When you are specific, you are able to break your goal down into actionable steps and can measure your progress along the way. Set yourself up for success, not for failure! If you are a hard-driving, high-achieving, motivated person (or want to be one), it is so easy to make a huge mistake at this point. You are probably tempted to set a goal that is too ambitious and you are setting yourself up for failure. Trust me, I’ve done this more times than I care to admit! If you set unrealistic goals, those goals can become demotivating instead of being the inspiration that keeps you moving forward. It is very important to set realistic goals, not just for your marathon training but for your overall life, as well. It can be very motivating to realize half-way through your training that you set a goal that was too easy and to be able to adjust your goal upward at that point. On the flip-side, however, it can be emotionally devastating to have to scale back because you bit off too much to chew from the start. Do yourself a huge favor and set yourself up for success! “I’ve never run a marathon before, so how can I know what should be a realistic goal?” you ask. The answer is simple: You set your marathon goal based on some current or previous achievement and extrapolate that result out to a realistic marathon goal. I’ll show you how. His calculator is very easy to use and I’ve found it to be an exceptionally reliable tool. The premise is simple: You take the time of your best race and enter that time and distance into the calculator. Based on that time/distance, the calculator tells you what times you should be able to run for other distances using roughly the same amount of “effort” of your previous race. For example, if you can run a 10K in 1 hour (60 min), you should be able to run a half marathon in 2hrs 13min, and a full marathon in 4hrs 41min. How cool is that? The thing I love the most about this tool, is that, if you’ve run some other distance like a 10K before, it shows you in a very real way that you CAN, in fact, run a marathon. 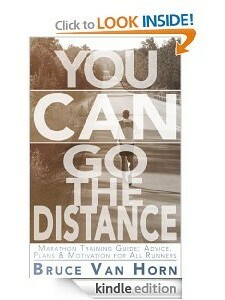 Not only does it show you that you CAN, it shows you how fast you should be able to run it if you put in the training. You can plug in any known distance and time and it will give you the same “equivalent effort” results. No matter what, I want you to set a specific goal with a specific finish time!. Don’t say “Well, I don’t really care how long it takes, I just want to finish.” That’s just a dream, not a measurable, trainable goal. OK, now we have a specific time that we can plug into our calculator and start training to reach that goal. Dreams are just vague wishes. Goals are specific and measurable. Set Goals! So now you know what to do. Set a goal! Pick something realistic using the McMillan Running Calculator and go for it. Every group of people with similar interests, be they accountants, engineers, nurses or runners, have a kind of language they use, a jargon that you need to get used to. And they all love acronyms! Runners are no different, so here are a few you should learn right away. When you use the McMillan calculator, or any other tool, to set your race goal, there are two numbers you need to pay attention to. First, what is your Marathon Goal? This is your overall time in which you plan to run the marathon. Mine is 3:30 (3 hours, 30 minutes). Yours may be 2:45 or 5:30. So just remember this time because I’ll reference your Marathon Goal in upcoming chapters. Second, what is your Race Pace (RP)? This is simply your Marathon Goal broken down into an average Pace Per Mile (PPM). For example, my Marathon Goal is 3:30, which breaks down to an average PPM of 8:01 (8 minutes, 1 second per mile). So my, Race Pace (RP) is 8:01. Also, as I cover some specific types of running workouts, you’ll encounter terms like: Yasso 800s, Tempo Runs, Long Runs, Recovery Runs/Jogs, Tapering, etc. Don’t get too hung up on these if you are confused already. I just want to prepare you for some of the acronyms and jargon that you’ll encounter and that I’ll used (as sparingly as possible) throughout this book. Still think there is too many exclamation points, not sure that explanation of term should go in this chapter. Adina, great comments. You are right. There were too many exclamation points. I took many of them out. This chapter has got me re-evaluating my goal for my upcoming 50 miler! No longer will it be to simply finish! I WILL. Set a more appropriate goal and know the I CAN accomplish it!